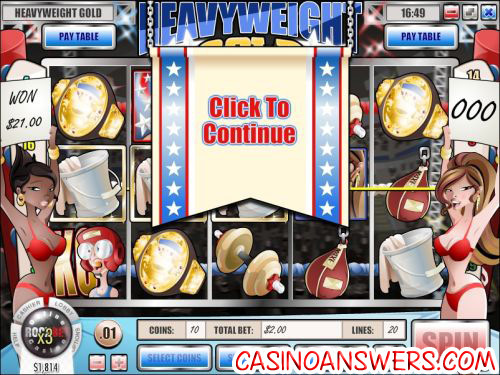 Heavyweight Gold iSlot Guide & Review - Casino Answers! Heavyweight Gold opens with a video cutscene of a boxer lacing up his boots. The bell sounds and suddenly he’s in the ring, getting punched by a much larger opponent. Suddenly, an obvious Rocky-inspired tune starts playing and your character starts throwing away, knocking his opponent out. He then holds the championship belt up triumphantly and screams “YEAAAH!” in a way that will get anyone amped to start spinning the reels! Heavyweight Gold is a 20-line video slot, which means that if you want to bet on all 20 lines (which we strongly recommend), the minimum bet you can make is $0.20 per spin. You can choose between $0.01, $0.05, $0.10 or $0.25 for coin value and you can choose to bet up to 10 coins per spin. At $0.25 coin value X 10 coins X 20 lines, you are looking at a maximum bet of $50 per spin if you’re a high roller. Or maybe your favourite part is the free spins. If you get 3 or more free spin icons (the ring girl), you can win yourself 10, 20 or even 100 free spins. The best part about the free spins is the 3X multiplier, so you can win three times as much. 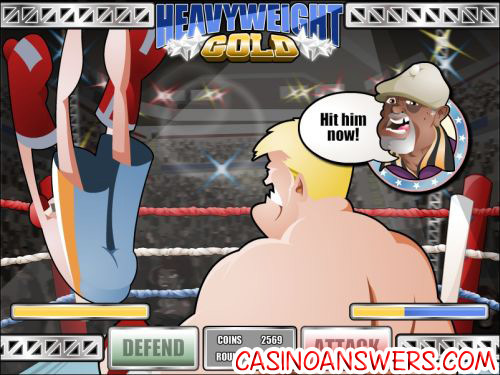 Heavyweight Gold captures the feel of the boxing ring very well and is a lot of fun to play. If you want to try it out, Casino Answers offers a $100 no deposit bonus exclusive promotion at Rockbet Casino for those who want to try all the iSlots they like before making a deposit. iSlots are interactive slot machines exclusive to Rival Gaming online casinos (such as Rockbet). They feature free spins, bonus rounds and expanding wilds. The interactive aspect is in the bonus rounds – they do require a minimal level of skill to play. Don’t be intimidated, it’s much simpler than playing a video game. The interactivity doesn’t make the iSlots challenging, but rather more fun. I’m a United States-based online casino player. Can I play the Heavyweight Gold iSlot? Can I get a no deposit bonus to play the Heavyweight Gold video slot? Yes, players who are looking to try the Heavyweight Gold slot game for free before making their first deposit can take advantage of a special promotion over at Rockbet Casino to get a $100 exclusive slots no deposit bonus! Where can I play Islots? What are islots? What are interactive slots?